Spotted Bat is a species of bat from the family of Vesper Bats. The Spotted bat is named such because of its 3 white spots found over each shoulder and on the backside. This species of bats is considered as America’s one of the most striking mammals. Spotted Bat is relatively a large bat and looks very different from other species of bats. Their scientific name denotes their looks. The term Euderma means good skin and maculatum means spotted. The Spotted Bat is the largest bat of North America. Size: The size of the bat can reach up to the length of 124 mm. Color: Spotted Bat has black fur on back. Two white spots are there on the shoulders. It has a white spot on the rump and the portion below is covered with white fur. There are small white patches under each ear. The bat is pale colored. It usually has a combination of grey and pink. Ears and membrane are pinkish in color. The face is black colored. Wingspan: The wingspan stretches up to 14 inches. Weight: The weight of this bat varies around 16 to 20g. Tail: The tail is 51 mm in size. Ears: Size of their ears is 42mm. Forearm: The size of forearms extends up to 51 mm. Fur: The fur of Spotted Bats is long and silky. 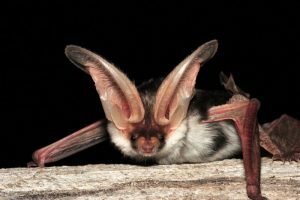 The Spotted Bat is abundantly found in Mexico, California, Arizona, New Mexico, Colorado, Utah, Idaho, Montana, Oregon, Nevada, Texas, Washington and British Columbia. They are found in western part of North America and stretches from British Columbia down to Mexico. The Spotted Bat can be found in the semi-arid regions of the western United States and northern Mexico. Some Spotted Bats migrate from colder to warmer areas during the winter. They also go into torpidity in cold weather. This means that its body temperature will fall to that of their surroundings and its heart rate will slow down. 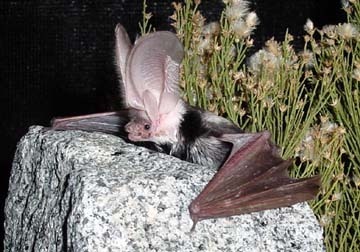 Spotted Bat lives in desert scrub and open forest areas. They perch in cliff faces and rock cracks. Spotted Bat loves to stay in open, dense deciduous and coniferous forests. They also prefer hay fields, marshes, deserts and dry shrub-steppe grassland areas. 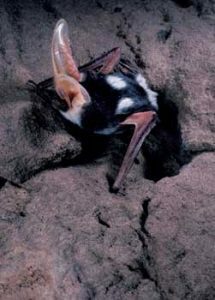 The spotted bat feeds mainly on insects. It feeds completely on moths though. They rip off the wings of the moth and eat only the abdomen portion. Spotted Bats eat medium-sized moths, grass hoppers, beetles and caddis flies too. The Spotted Bat has certain behavioral traits. The spotted bat is an insectivore. They perch in the small cracks found in cliffs and stony outcrops. Individuals fly in cryptic patterns from their roosting sites while foraging. Spotted Bat is territorial by nature. Spotted bats are known to maintain exclusive foraging areas. These areas range from 3 to 6 miles from their site of day roost. They stay in this area from about an hour after sunset till an hour before sunrise. Spotted Bats are high fliers. The predators of Spotted Bat are owls, raccoons and dirty dogs. These are some of their few natural predators. The adaptive features of this moderately large bat are quite attention grabbing. They are the only mammals who can fly. They hibernate when the seasons change. They are nocturnal beings and so Spotted Bats use echolocation to spot their prey. Spotted Bats can use their wings and tail membranes to catch insects. The Calls of Spotted Bat are of low frequency and echo sounding. Spotted Bats make use of low frequencies ranging around 9-12 kHz. This is why they need open areas to stay. Spotted Bats hibernate in cliffs. They hibernate in small groups. The mating season of Spotted Bats usually takes place during the autumn season. Males in reproductive condition have been found in later half of the summer and after summer. Spotted Bat may mate later in the feeding season when they are heavy and in good physiological shape. Spotted Bats are solitary breeders. Females give birth to one pup every year. If the spotted bats were “average” small mammals, then their young ones would be born in early phase of winter when bugs are sparse. However, many temperate zone bats have grown the physiological forte of delayed fertilization. The females confiscate the sperm during hibernation so that the sperm does not meet the eggs until spring. Hence, the bat pup is born and weaned during peak insect activity. Young ones do not have the spots like the adult. The young ones do not have fully developed ears at birth. The newly born Spotted Bat is very small in size. It weighs around 4 to 5 grams, which is about one fourth of the mother’s weight. The pups are born blind and do not have any fur. Mothers look after their pups till they reach approximately 6 months of age. Spotted Bat is known to live for about 20 years. Spotted Bat is listed in the category of “Least Concern” by the IUCN. Find out some of the interesting facts of this docile animal. The ears of the Spotted Bat are rolled up around its head when it sleeps. The echolocation of the Spotted Bats is so low that it cannot be heard by humans. The Spotted Bat inflates with blood and unrolls itself when it wakes up from slumber and is active. A newly born Spotted Bat is about the size of a green grape. 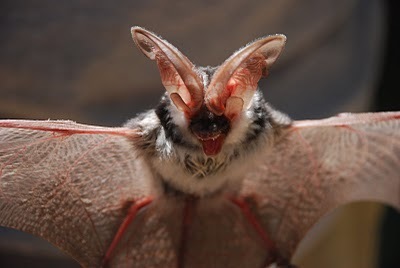 The Spotted Bat is declared as threatened only in Nevada. They are state protected in Nevada. Here are some of the astounding pictures of this mammal.